TEGNA’s new home is 46,000 square feet on the tower’s top two floors, plus a private rooftop lounge. The company, which spun off its publishing business, including USA Today, used to have one tower on a large campus in Fairfax County. 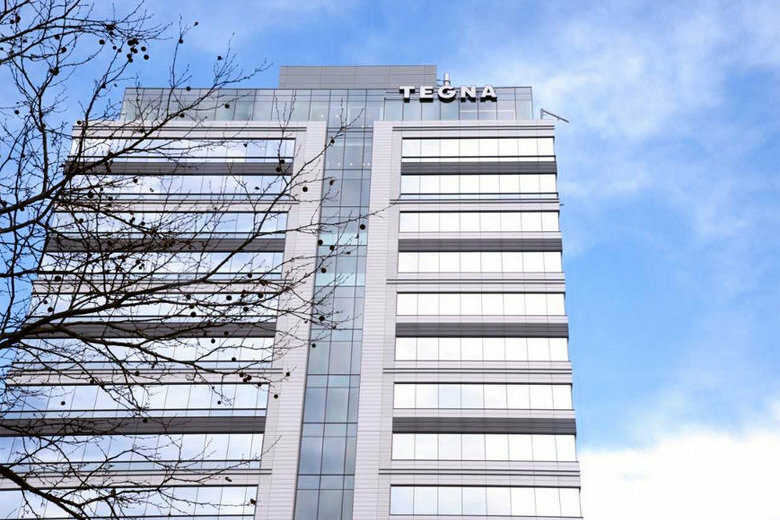 WASHINGTON — Broadcasting and digital media owner TEGNA Inc. is the first tenant to move into the new Boro Tower office high rise in Tysons Corner. TEGNA’s new home is 46,000 square feet on the tower’s top two floors, plus a private rooftop lounge. The company’s new headquarters space includes a multipurpose space for meetings and events, a 25-foot LED display wall on the 20th floor, a three-story interior staircase going from the 19th floor to the rooftop lounge, and TEGNA to Go, its own private market with fresh food and drinks. “We are proud to be in our new home at The Boro. Our space is truly beautiful, and our team is already enjoying their custom work space with 360-degree views of Tysons, D.C. and the Shenandoah Mountains,” said Dave Lougee, president and CEO. TEGNA sold its previous headquarters at 7950 Jones Branch Drive in McLean in 2016 for $270 million to London investment group Tamares, and has been leasing back its space until its new headquarters was ready. Boro Tower, at 1750 Tysons Blvd., is part of Meridian Group and Rockefeller Group’s The Boro development, a multiphase project next to the Greensboro Metro stop. The entire 15-acre development will include residential units, retail, a hotel, a Whole Foods Market and a 14-screen Showplace ICON theater. Other big tenants moving to Boro Tower include law firm Hogan Lovells, law firm Womble Bond Dickinson, engineering firm Alion Science and Technology, and tax and advisory firm KPMG LLP, which will be the largest tenant, bringing hundreds of employees to its 168,000 square foot headquarters. Several restaurants have also signed on to the project, including Tropical Smoothie Cafe, Taylor Gourmet and Bluestone Lane.